Are you a fan of cat collectibles? Interested in starting a collection (or know someone who might be)? The Internet is like a dream come true for collectors. No matter your passion, if you're into collecting and there's a collectible market for it, you can bet you can find it online. And cat lovers are no exception. And, if you're looking for gifts, you can buy cat collectibles online from a number of sources. Or, you can ditch your friends, family, and loved ones and treat the cat lover in you to something special. Go ahead, be selfish. You deserve it. Below are some feline themed offerings. The Bradford Exchange Online (formerly Collectibles Today) has a wide assortment of gift items to choose from. Not only do they have collectibles and cat and kitten figurines, but many unique gift items for pet lovers or for just about anyone or any occasion. They carry premium brands such as Disney items, items from Thomas Kinkade and, of course, the Bradford Exchange, in addition to charity collectibles as well. Whatever the time of year, occasion, or holiday, they have a gift for your favorite cat lover. They also carry much more than just feline related items. You can decorate your home with their selection of holiday decorations, or take a look at their line of personalized jewelry gifts. They also have (sssshhhhh!) dog related stuff. Shocking, I know. This link will take you to the Pet Lover Gifts and Collectibles Store. The selections at the above link should keep you busy, but below, you'll find some more items that might make good gifts, unless, of course, you're shopping for yourself. 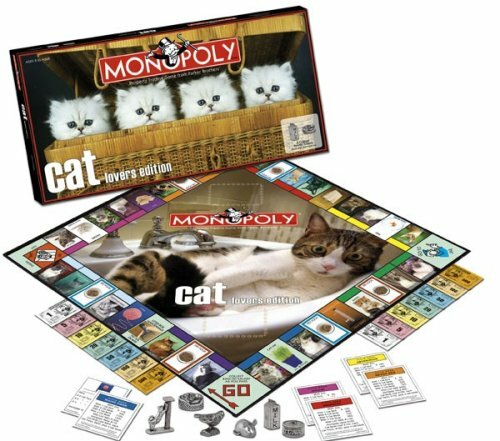 Monopoly Cat Lovers Edition is the obvious choice for Monopoly fans who are also cat lovers and want a collectible edition of this classic game. Jim Davis, the creator of Garfield, grew up with 25 farm cats. In the late 1970's, Jim created a comic strip character around a fat, grouchy cat that he named after his grandfather, James Garfield Davis. Today, that comic strip is the most widely syndicated comic strip in the world. That makes the fat, lasagna loving cat with an assassinated ex-President's name one of the most famous cats in history.